Time can fly by quick like a bat in the night. So, it is important to map out how you want to set up your garage haunted house. This may include how much time it is going to take, how scary the attractions are going to be, the cost of setting everything up, and where you want to purchase supplies. Brainstorm ideas a few months in advance so when the time comes to start transforming your garage this month, you know exactly what to do. There is no sense in going to the store to buy brand new decorations if you already have some from years past sitting around in storage. Make a list of what you need and try to find as much as you can before heading off to the Halloween, grocery, or hardware store. Set your garage apart by incorporating new and fun technology in your haunted house. LED lights are safe and durable to use, not to mention they are a way to intensify the scare level. Adding music is also a way to immerse your guests into the haunted house feel. Choosing the right soundtrack is important when finalizing your technology. Safety comes first. Remove any cars, machines, bikes, or anything that may get in the way and cause can accident while someone is walking through the haunted house. Once all dangerous items are removed, it is important to map out how you want the haunted garage to look in the space that you cleared out. Once the setup is complete, with decorations and safety in mind, you are ready to spook your neighbors with your haunted house garage. 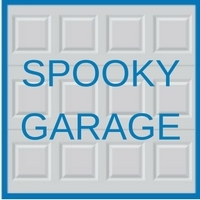 After those who have dared to walk through your garage of ghouls have successfully exited, ask them what they liked so that next year you can turn up the spook factor. If you are thinking about upgrading your garage with a custom door or need assistance planning a new structure, we can help. To learn more about the variety of services we offer, call 630-852-8485 or contact Blue Sky Builders online today.